Alex Woodrow, Managing Director of Knibb, Gormezano and Partners recently chaired the TBM Batteries for NRMM Conference in Frankfurt, Germany. The conference was very well attended with over 30 OEMs, several suppliers and other stakeholders taking part, totalling around 100 delegates. As the first dedicated conference to the subject it was interesting to understand the concern and issues facing the industry as it looks to continue its recent progress in reducing its environmental impact. This first briefing on the topic of Batteries for CV and NRMM sets the scene, and examines the total market size in KGP’s base case scenario for the market, the subject of a forthcoming extension to our CV and NRMM powertrain forecasts. With ‘DieselGate’ rumbling on many governments worldwide are considering the future of ICE only vehicles and will legislate to effectively ban them over the next decade. Some are going even further, also seeking to skip past hybrids and only about allow electric only new vehicle registrations. As a result OEMs and the supply chain are investing billions in battery technology and the requisite powertrain electronics, motors and other components. Whilst the passenger car market gets most of the attention, and this is the focus of many Governments’ announcements, OEMs and suppliers are busy working on electric and hybrid vehicles for the CV and Non-Road Mobile Machinery markets. Of course, however, there are significantly different challenges between the three industry segments, not just related to the volume gaps, but also the different duty cycles, working conditions, life cycle and energy demands of working shifts. This is the focus of much of KGP’s current projects, and the subject of our forthcoming multi-client study covering CV and NRMM electrification and alternative fuels. 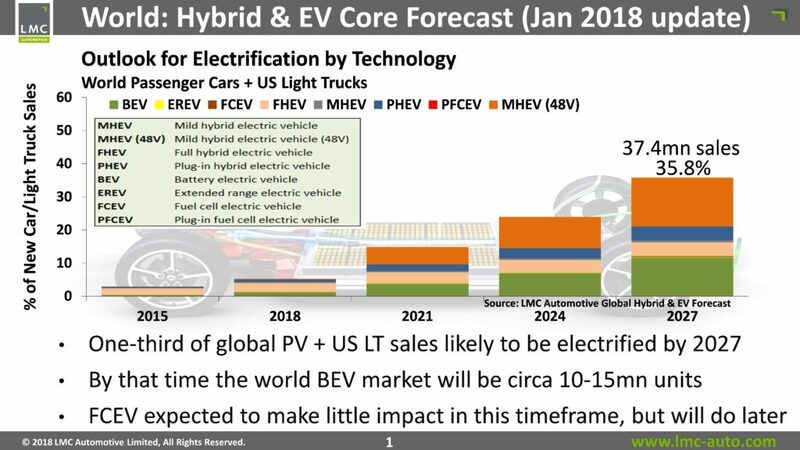 Taking a step back, firstly let’s look at the overall potential light vehicle market advanced battery market using LMC Automotive’s Global Electric and Hybrid Vehicle Forecast summary. What does that mean for battery demand annually by 2027? Based on LMC’s forecast over 15% of global light vehicle sales could be electrified as soon as 2021, including around 5% all electric vehicles (BEVs), 6-7% 48V mild-hybrids, with the remainder across the various hybrid technologies, including full, series and plug-in variants. By 2027 that total is forecast to grow to around 37.4m electrified vehicles or around 36% of total sales. Based on KGP’s analysis of battery sizes, by segment, a crude calculation of the battery demand would be 560GWh, equivalent of 11 Tesla Gigafactories (2018 capacity of c50GWh). With many countries considering legislation to require higher all electric ranges from both PHEV and HEVs the average size may be 25% higher, giving a potential 700GWh demand for batteries by 2027. Looking to the CV and NRMM segments demand will be substantially lower, at least in the medium term. In comparison to the light vehicle segment, KGP’s base case is naturally conservative, as are the CV and NRMM industries’ customers. The dominant segment today is the forklift segment, where over 200,000 units per year are already battery electric, albeit mainly lead acid batteries. The Chinese bus segment is the 2nd largest with around 80,000 units per year all electric, depending on how the sizes are compared, and the degree of false accounting included, and is the only other majorly significant electrified segment globally at present. However KGP’s recent analyses identified over 150 CV series models and pre-series prototypes and a similar number in the NRMM segment. With it certain there are many more OEMs are keeping under-wraps there is potential for significant growth in availability, if not volumes. However not all vehicles batteries, and so demand and volumes are likely to be difficult to predict and we are currently examining this in more depth. So in our base case the market represents little over 10% of the battery required for the LV segment, assuming the forklift segment grows and switches to Lithium chemistries. How does that translate to value is a key question, which leads us onto sensitive price question. What is happening to price? Forecasts and estimates vary according to the supplier and the customer. Clearly prices depend on the volume, length of supply agreement etc. Average prices for batteries are falling. It is estimated by 2027 that the price could fall below $100KWh at a pack level. At that price the total value of the market annually would be a staggering $62Bn a year. However for CV and NRMM we believe the price will remain considerably higher. In comparison to the light vehicle OEMs we have discussed the issue with put the current price for CV at around $400 per kWh and $1,000 for NRMM, based on volume, pack size, and the additional cost related to durability and safety. The latter however is very dependent on the end use, so forklift variants would be considerable lower. Regardless at an average of $200 per kWh in 2027 the total market would be $15.4Bn, or 25% of the light vehicle market size. What issues face the CV and NRMM industries use of large batteries? An important question, which we expect to evolve over the next decade is what type of battery will be used in the CV and NRMM segments. While light vehicle currently focusses on NCA (Nickel, Cobalt, Aluminium chemistries) the working conditions and life cycle demands may require a different chemistry in the CV and NRMM segment. Automotive will seek to balance cost vs weight and performance, CV and Non-Road is more likely to prioritise cycle life, then cost and weight. The format will also be a question-mark, be standard cells like the 18650, automotive specialist type pouches or dedicated heavy duty products? Many other questions remain before widespread adoption, many of which are still being played out in the automotive manufacturers, which will mature faster than the CV and NRMM in many stakeholder views:. How sensitive and realistic are the forecasts to legislation? Which chemistries will be used? What is the cycle life for the applications, how does it differ by segment? What are the safety, maintenance and reliability issues for using automotive cells in the CV and NRMM segments? How will NRMM equipment charge? Will OEMs have sufficient capacity to maintain and repair battery electric vehicles? What will happen to end of life batteries? Will raw material prices support less than $100kWh prices, especially cobalt etc.? How will the supply chain develop, where will the capacity come from? Will solid-state become a cost effective option for CV and NRMM? Due to the differences between light vehicle, CV and NRMM requirements we see an long term evolution of the supply chain for CV and NRMM which is likely to be slower than the light vehicle segment. In the light vehicle side OEMs scrambled in the late 2000s to increase capacity, for demand that eventually did not materialise. In parallel their battery cost reduction and performance improvement perhaps didn’t meet their expectations. As a result a lot of investment in batteries was written down, albeit leaving some value in the IP around making battery packs, rather than cells more effectively. Back in 2005 a major light vehicle OEM was seeking suppliers for batteries. KGP’s project for the OEM identified 150 suppliers of batteries, or potential joint ventures partners. Since then a majority have exited the market, as technology roadmaps didn’t sustain the march towards the prices and energy density OEMs required. As a result the battery market has become increasing concentrated, a concern to many OEMs, which appear to be hedging their bets on future technologies. Regardless of the CV and NRMM segment it seems certain that none of the OEMs will produce high volume cells. These will shift to being commodities and the OEMs will seek to piggy-back on automotive technology where possible, although in many cases this may not be suitable. Toyota Industries/Toyota/Hino is one of the few that might have in-house capacity, using batteries from PrimeEarth, Tesla surely will and BYD will. But for most OEMs the IP will be in the integration, how the batteries are packaged, novel methods for repair and maintenance and battery ownership models, potentially including battery swapping may be developed. Charging and maintenance solutions will be different as many AG products and CE are in the field, quarry, mine or remote site, unlike forklift trucks which are closest to automotive in their characteristics and operate in a fixed location. Information contained in this document has been obtained by Knibb, Gormezano & Partners from industry sources believed to be reliable. However, because of the possibility of human or mechanical error by our sources, Knibb Gormezano does not guarantee the accuracy, adequacy, or completeness of any information and is not responsible for any errors or omissions or for the results obtained from the use of such information.